Ravioli with brown butter and sage. Roasted asparagus with balsamic browned butter. Cocoa brownies with browned butter and walnuts. Well I’ll let you in on a little secret. As long as you swear not to let it leak. Pinky Promise? ….Brown butter is easy to make. No iron chef skills needed here. Just a little patience. If I can do it, you can do it too. My favorite food blogger, Joy the Baker, published her first cookbook last month on my birthday. Coincidence? I think not. She loves brown butter. She adds it to her baked goods because it provides a nutty richness. 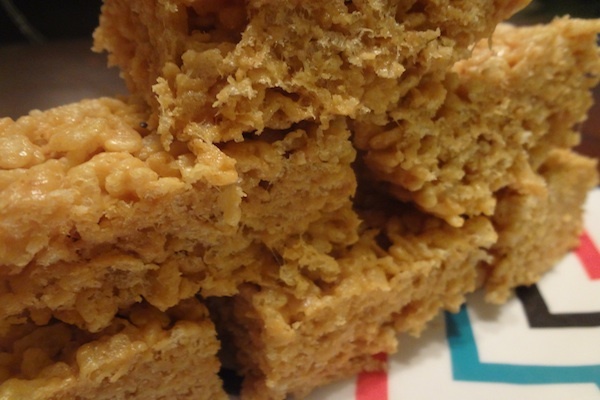 After making the browned butter peanut butter crispy rice treats from her book, I’ve also become hooked on all things browned butter. To make browned butter: heat butter in a silver-bottomed skillet over medium heat so you can see how the butter is changing color. Once the butter is completely melted, it will foam and froth, and then crackle and pop (oh snap). These noises are the water cooking out of the butter. Once the butter gets quiet again, the fat solids will start to brown. This transformation happens quickly so keep an eye on it! The browned butter is ready when it smells rich and nutty, and is a chestnut color. Remove it from the pan after scraping all of the brown bits left on the bottom of the pan. Butter an 8-inch-square baking pan. Set aside. In a large, heavy-bottomed saucepan, melt butter over medium heat until just browned, as described above. Just as the butter begins to brown, add the marshmallows, peanut butter, and salt. Stir ensuring that all of the cereal is coated in the marshmallow mixture. Turn the mixture out into the prepared pan. 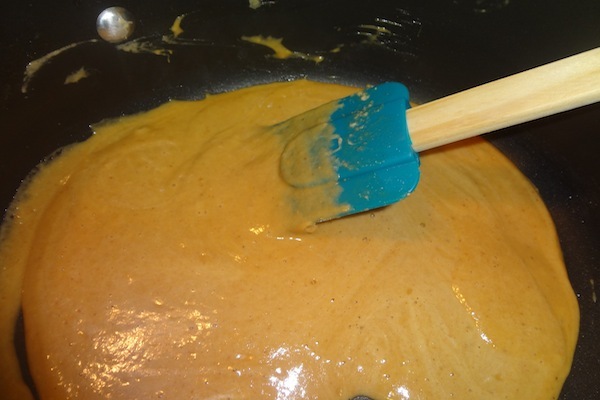 With buttered or oiled fingertips, press mixture into the sides and bottom of the pan. Let cool and set for at least 30 minutes before slicing into 9 large blocks. Do you really mean 12 cups of peanut butter or is it suppose to read 1/2 cup? I don’t have crispy rice can i use Filipino rice and if yes how many cups i have to add 6 cups or what?